Imagine grilling out on your patio, your close friends sitting at the table beside you enjoying the beauty of your backyard. Or maybe you are with your kids, roasting hotdogs over your fire pit, sitting on the short wall that encloses the space making it private. Do you have a pool? Then it would be nice to have a paver path between the pool and the pool house as well as a beautiful patio to match. Oh, to have a space to lay out by the pool and still have enough space for some tables and some snacks! 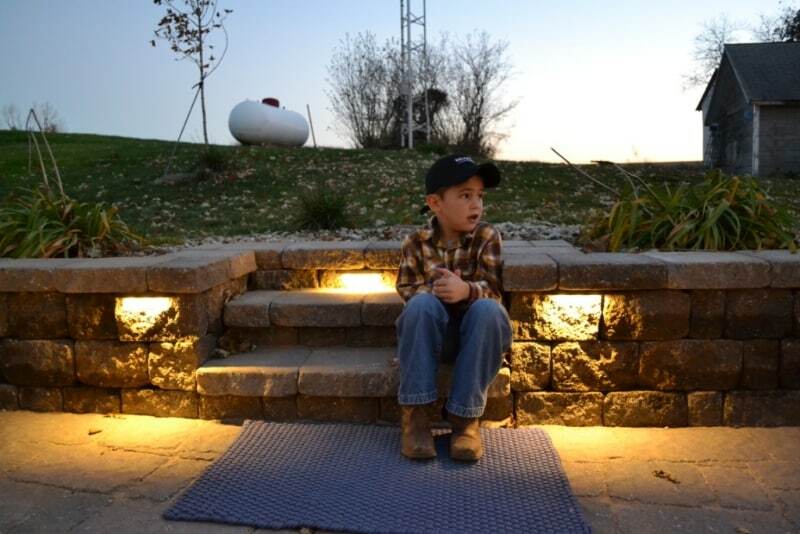 These are a few of the ways that hardscapes can help. 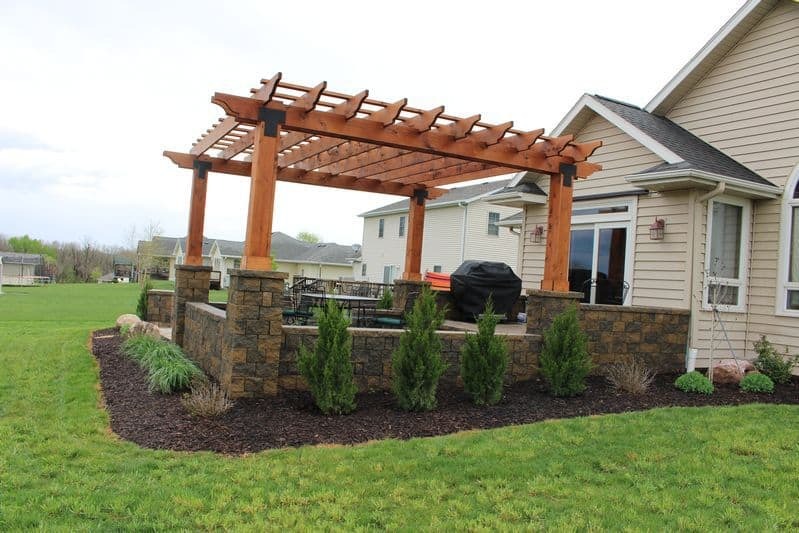 Hardscapes are the parts of your landscape that are made with nonliving materials. 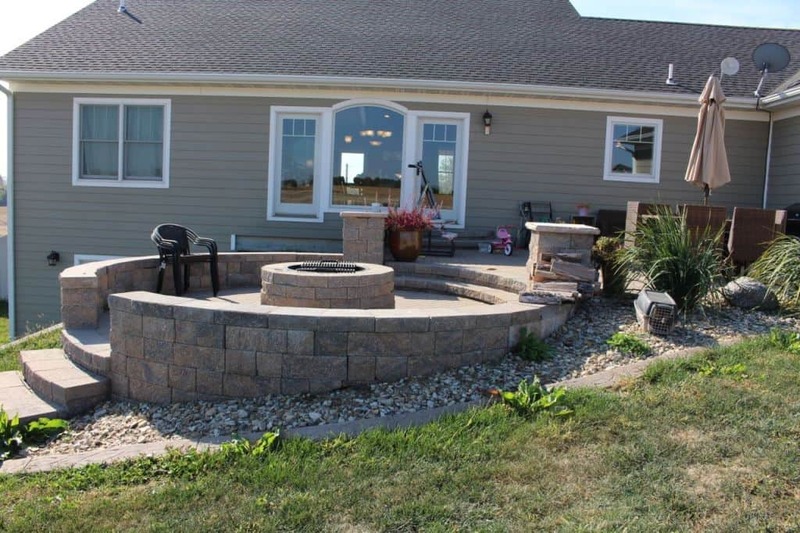 Walls, patios, and fire pits all fall into this category. 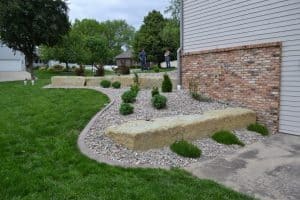 Below is a list of some of the common hardscape features Grimm’s Gardens can create. Bring your lunch outside to enjoy the beautiful day and listen to the sounds of nature. 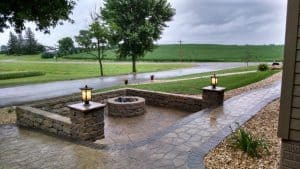 A patio can be as simple as a square all in the same paver, or as complex as combining several different patterns, sizes and colors of paver to separate the different parts of the patio. 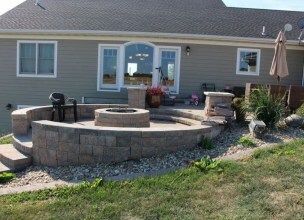 Our patios are made with clay bricks or Belgard pavers. Visit their website to check out the many styles and colors to choose from. The biggest benefit you will receive from a paver patio is the ability to easily fix it. Concrete cannot be repaired once it cracks (and it always does.) 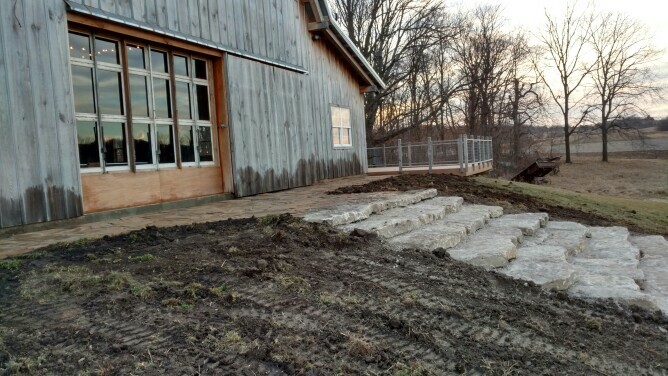 Pavers can be lifted and reset to level while reusing your existing materials. Besides, a paver patio looks prettier! Paver walkways and stairs bring out the best in a house. They add formality and structure to a front entrance and they connect one outdoor space to another. A sitting wall is a short, often freestanding, wall that is just the right height to sit on. This is a dual purpose item because it provides extra seating space when needed but it also functions as a wall to divide the outdoor space just like a house wall does. We always cap our walls to give them a clean, professional look. 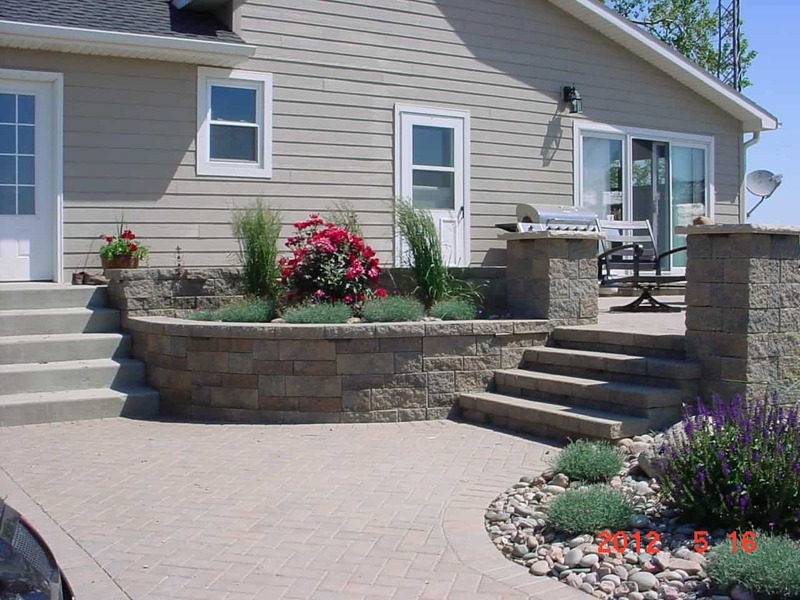 Retaining walls can be much larger than sitting walls. 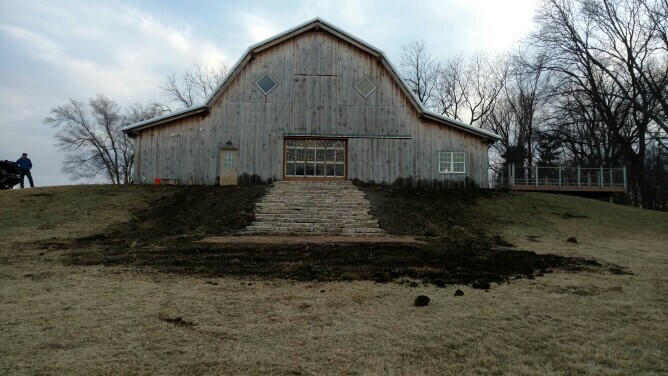 Their function is to hold back soil and to fix erosion problems. 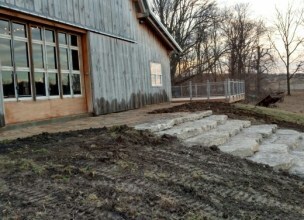 Often times, the existing concrete wing walls are not long enough to stop all the erosion problems so we add a retaining wall to the end that curbs the erosion. 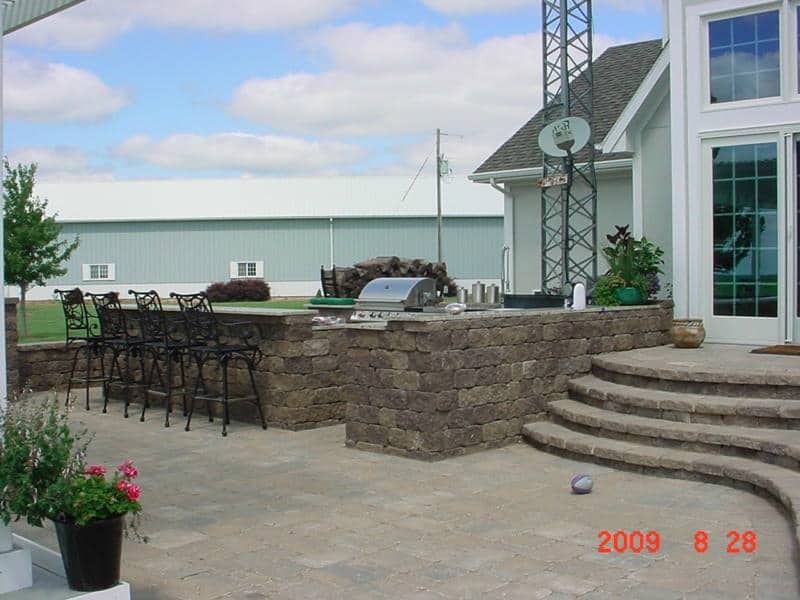 Block or natural stone retaining walls can help with just about any size of project. When the walls start getting larger than 4 or 5 feet, we use a geogrid that reinforces the soil to increase the strength of the wall tenfold. 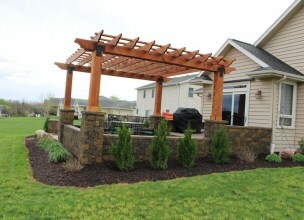 Columns can be added to sitting walls to add some pizzazz to the area. It is a clean way to finish of the end of the wall, adds elegance, and a sense of stateliness. These columns often include some form of lighting as well to accent the area and increase it’s usability. Columns are most often added to the corners and the ends of a sitting wall. Fire pits are a joy to all who use them. They can be wood or gas burning and just about any size or shape. Our standard fire pits are about 3′ across. 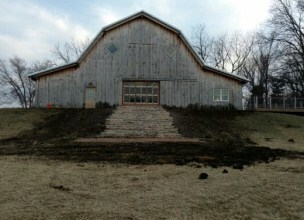 We are sure to plan for drainage in the bottom of the fire pit so that it doesn’t flood when it rains. We can use block to create an outdoor kitchen space for entertaining! We can include space for your grill, a bar for your guests, and plenty of cooking space. Check out our sample kitchen at our rural garden center!